He is one of the two fallen angels that broke free from his imprisonment in hell and begins to cause the disappearance of the guardian angels on earth. Zeus gave him the ability to read minds with his fingertips, when he became a Saint Beast. 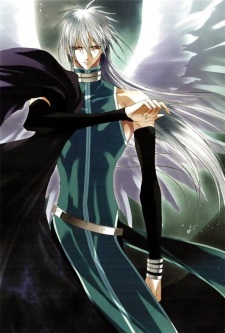 He is very close to Suzaku no Rey and he has the ability to fly (his wings is pure white in color with a shade of blue) and he was also referred to as the Golden Phoenix. It was revealed in the CD Drama that the tunic on his head hides a tattoo that seals his memory - of being the son of Zeus and Chronos' wife (Chronos was the God before Zeus), not of an angel and only two angels knows this: Judas and Rey.